Celebrate your hobbies, interests, and favorite motifs with the designs featured in this week's series -- it's an all-new Request-fest! 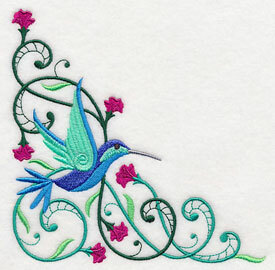 All of this week's designs come from your ideas and suggestions, and are a fabulous addition to any embroidery project. 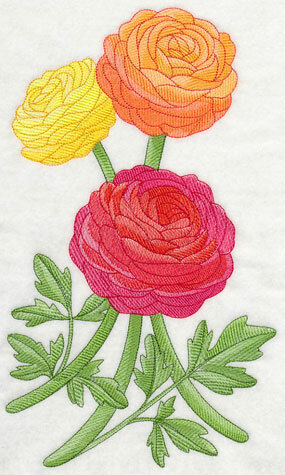 Stitch a colorful hummingbird on a living room pillow, or adorn your next quilt with radiant ranunculus flowers. 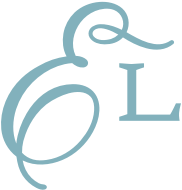 Plus, new dress forms, firefighter emblems, dog sketches, and more! Order today, and enjoy the amazing variety of designs! 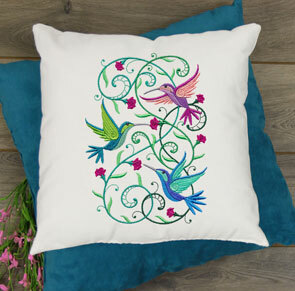 Brighten pillows, quilts, and totes with cheerful, whimsical hummingbirds. Leslie really liked our previous spring potpourri packs featuring butterflies, dragonflies, and honeybees, and suggested we create a matching set of designs using hummingbirds. 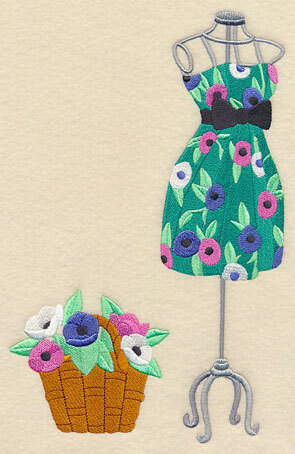 She especially thinks these designs will add color and whimsy to apparel, such as a summer vest. 6.90" x 9.50" and 5.85" x 8.05"
6.07" x 11.75" and 4.86" x 9.41"
4.03" x 7.81" and 3.54" x 6.86"
Not only do the bright flowers and playful details in these hummingbirds add a seasonal look to apparel, but they're sure to brighten up pillows, wall hangings, quilts, and more, too. 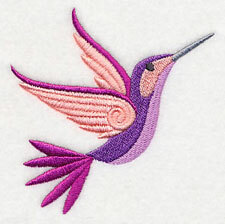 11.76" x 4.41" and 9.41" x 3.53" and 7.81" x 2.93" and 6.00" x 2.48"
Use all of the hummingbird potpourri designs together, or pick your favorites to stitch alone! 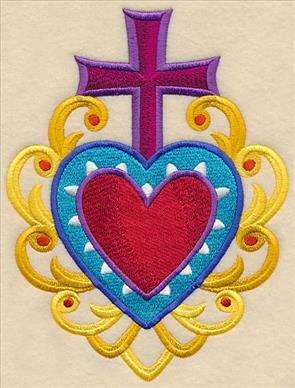 These corner and accessory designs are terrific on pockets, napkins, and many, many more. 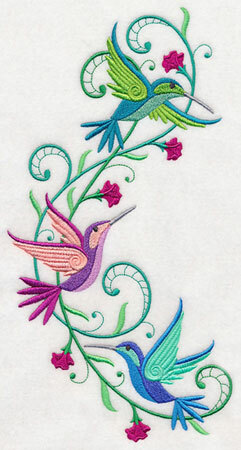 3.78" x 3.86" and 2.45" x 2.51"
Two more hummingbirds finish off this collection of bright and whimsical designs. 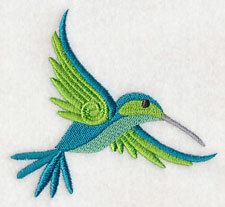 Let one land on your next embroidery project. 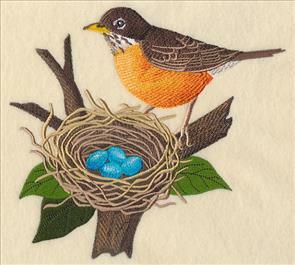 3.79" x 3.86" and 2.46" x 2.51"
Mary suggested a design featuring realistic birds sitting on branches next to a nest full of eggs. Here a robin stands guard in this elegant design. 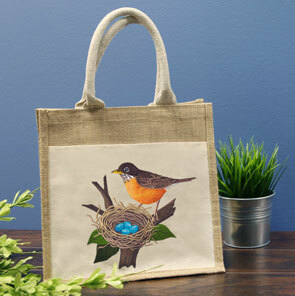 A burlap tote bag is the perfect place to showcase this robin design. 7.41" x 6.90" and 6.28" x 5.85" and 5.20" x 4.84"
In addition to the robin above, a female cardinal and Eastern Meadowlark have been digitized in this all-natural style. 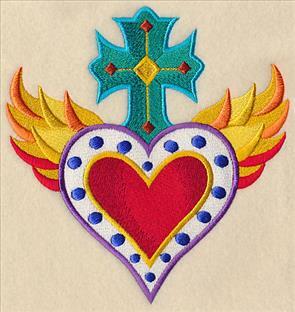 Great for pillows, wall hangings, quilts, and more. 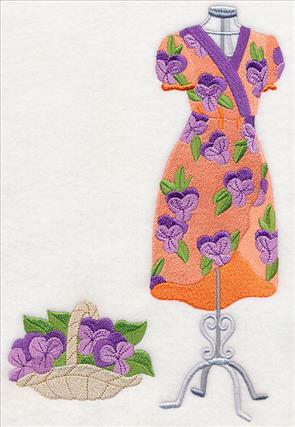 10.30" x 6.89" and 8.77" x 5.86"
7.79" x 5.21" and 6.86" x 4.59"
Spring flowers get their time in the spotlight with these blooming dress forms that were inspired by Mary's request. 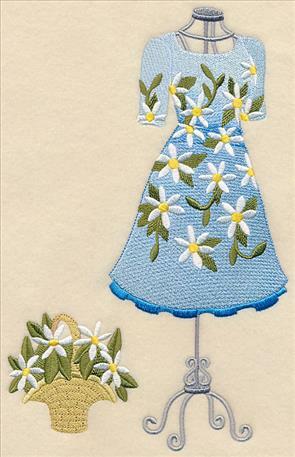 Each dress showcases a type of flower and is featured with a matching flower basket, too. 6.31" x 10.01" and 5.36" x 8.51"
6.28" x 10.01" and 5.34" x 8.51"
4.89" x 7.79" and 4.30" x 6.86"
Pansies are beautiful garden flowers perfect for adorning spring dresses; blooming crocuses are just as stunning. 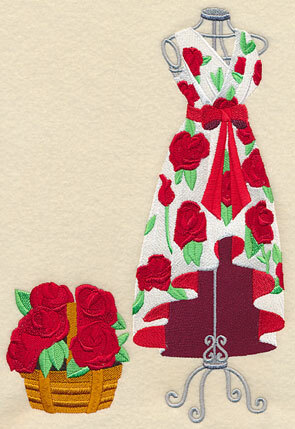 Stitch these dress forms on a quilt, or a series of framed art pieces. 6.54" x 10.01" and 5.56" x 8.51"
6.85" x 10.01" and 5.83" x 8.51"
5.35" x 7.81" and 4.70" x 6.86"
A rose dress form and tulip variation bring the beauty of the garden to your embroidery. 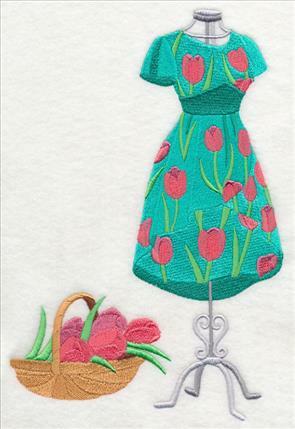 Add these spring designs to terrycloth towels, tote bags, and pillows. 6.78" x 10.01" and 5.76" x 8.51"
6.63" x 10.01" and 5.64" x 8.51"
5.17" x 7.81" and 4.55" x 6.86"
Pick your favorite flower from the bunch to stitch alone, or use several to create a matching set! 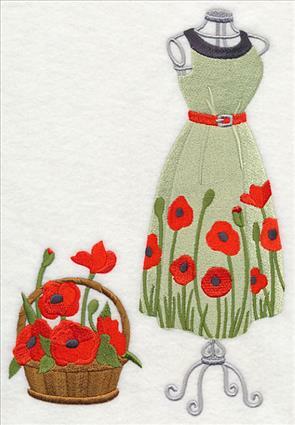 The poppy and peony designs shown here are beautiful when embroidered as a pair. 6.83" x 10.01" and 5.80" x 8.51"
6.49" x 10.01" and 5.52" x 8.51"
5.06" x 7.80" and 4.45" x 6.87"
This collection of dress forms in blooms is finished off by the gorgeous lilac design shown here. 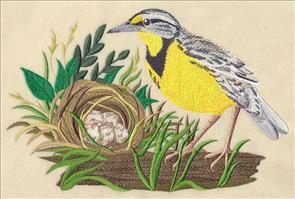 A hit on sewing projects, home decorations, and more. 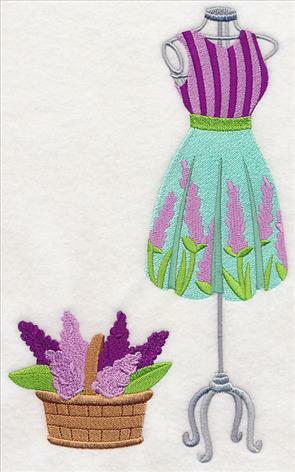 6.20" x 10.00" and 5.27" x 8.51" and 4.83" x 7.80" and 4.26" x 6.87"
Purchase these brilliant blooming dress forms individually by clicking the links above, or get all 9 of the designs in a pack. 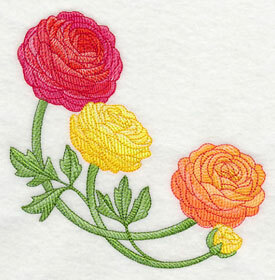 Judy's daughter-in-law loves ranunculus flowers, so she was hoping we could create a few designs to honor the stunning bloom. Thanks for the suggestion, Judy! These blossoms shine on quilts, bed linens, and more. 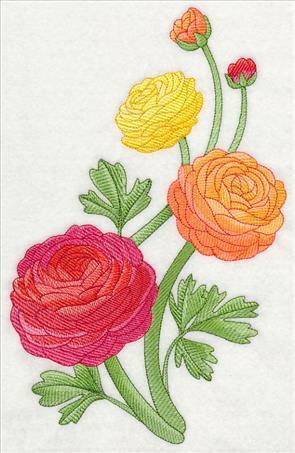 6.90" x 10.87" and 5.85" x 9.22" and 4.95" x 7.80" and 4.34" x 6.85"
Each of the ranunculus designs are created in a brand new style that uses light stitches to showcase the beauty of the flower. 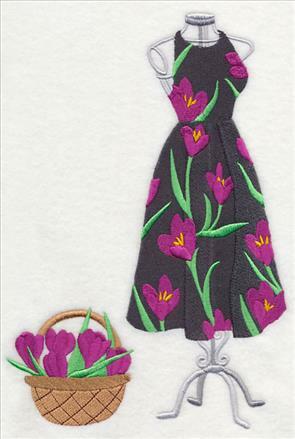 Be sure to stitch on neutral, low-nap fabrics such as linen, canvas, or twill as the fabric will show through the stitches. 6.89" x 8.14" and 6.34" x 7.49"
5.84" x 6.90" and 4.84" x 5.72"
lovely addition to any project. 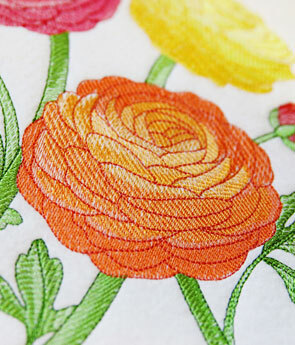 Because of the light stitching in these ranunculus blooms, dish towels and table linens are a particularly beautiful way to show off the designs. 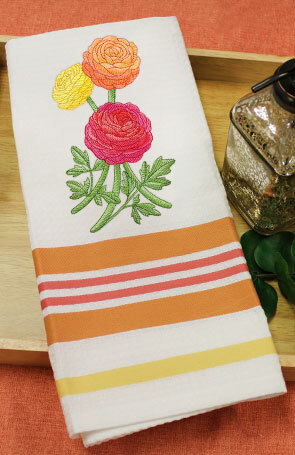 Stitch on a tablecloth, napkin, and placemat set, or add to tea towels for your kitchen. 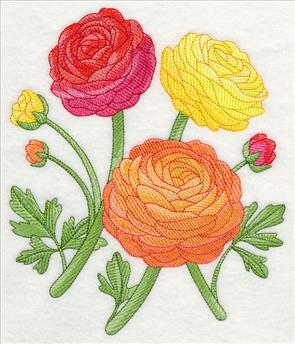 6.90" x 11.69" and 5.55" x 9.40"
4.60" x 7.80" and 4.04" x 6.85"
Adorn pillowcases, sheet sets, and other bed linens with these radiant ranunculus blooms to add a springtime feel to any bedroom. 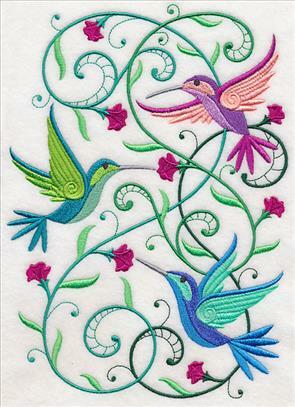 This border design is a particularly lovely way to update the edges of your projects. 11.74" x 4.08" and 9.39" x 3.26" and 7.80" x 2.71" and 6.00" x 2.29"
Finish off this collection of bright and brilliant ranunculus flowers with a versatile corner design. Beautiful for any project! 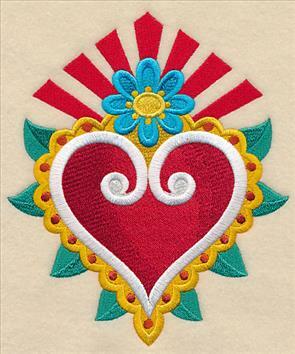 5.94" x 5.85" and 4.92" x 4.85" and 3.89" x 3.84"
Milagros are religious folk charms traditionally used in Mexico and Latin America, and are commonly referred to as Mexican tin hearts. 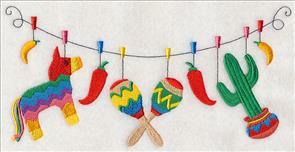 Brion requested the bright and colorful ornaments -- stitch on totes, apparel, and more. 5.86" x 7.73" and 4.86" x 6.41" and 2.93" x 3.86"
These designs are modeled after the shapes and colors of classic milagros, which are toted for their healing purposes, as well as for protection and good luck. 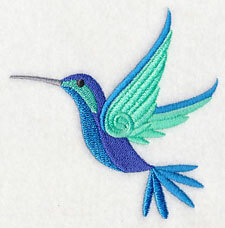 Add one to your next embroidery project! 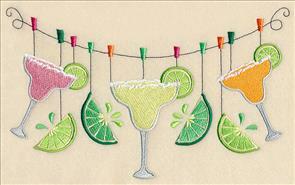 5.85" x 6.24" and 4.88" x 5.21" and 3.62" x 3.87"
Cinco de Mayo is just around the corner, and Barbara was hoping for a few clotheslines to help her celebrate the day. 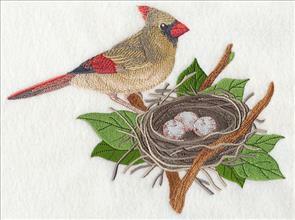 Stitch on t-shirts, tote bags, and more for a spicy addition to your embroidery. 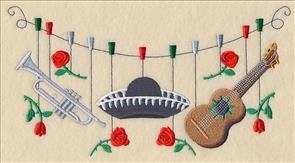 9.38" x 5.72" and 7.80" x 4.77" and 6.85" x 4.18"
In addition to the pinata and margarita designs above, a third Cinco de Mayo clothesline showcases the necessities of a mariachi band. 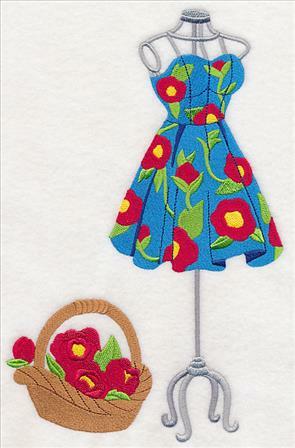 A great addition to a placemat, tablecloth, or towel. 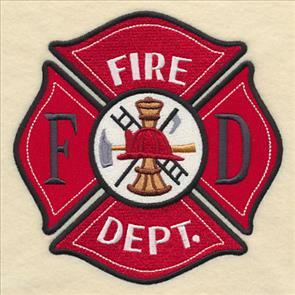 9.40" x 5.03" and 7.80" x 4.17" and 6.88" x 3.68"
Both Allene and Lois wrote in requesting designs to honor firefighters in their embroidery, and we loved the idea! 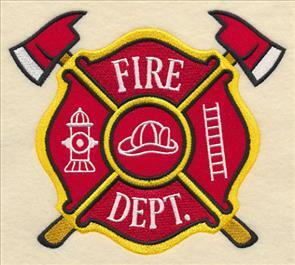 The Maltese Cross is a firefighter's badge of honor, signifying that they work in courage and bravery. 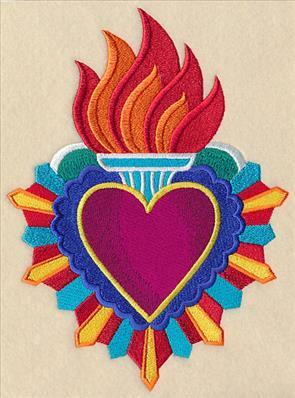 Add these emblems to jackets, gym bags, and more. 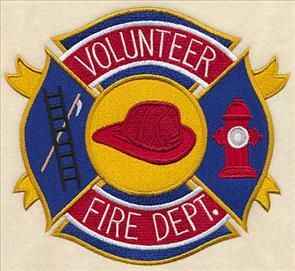 5.86" x 5.86" and 4.86" x 4.86" and 3.87" x 3.87"
In addition to the firefighters' Maltese Cross, we've also added a design for volunteers in the fire department! 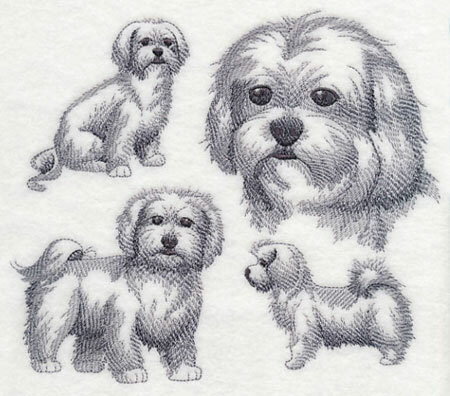 6.47" x 5.87" and 5.36" x 4.87" and 3.87" x 3.51"
The dog sketch designs are some of our most popular requests, and many wrote in for one featuring a Maltese. Add the too-cute pooch to pillows, pet beds, and more! 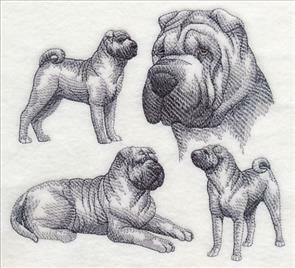 7.80" x 6.72" and 6.76" x 5.84" and 5.59" x 4.84"
In addition to the Maltese design, this week we decided to feature double the dog breeds with a sweet sketch and graceful Sharpei. 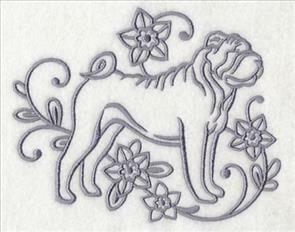 Patricia particularly wanted the adorable pup to embroider on her projects. 7.46" x 6.89" and 6.29" x 5.81" and 5.25" x 4.85"